An extensive real-time strategy (RTS), which takes place in a world inspired by the Middle Ages, but with supernatural features. The production can also boast an attractive graphic design. Pathos Interactive studio is responsible for creating this title. 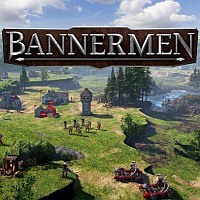 Bannermen is an extensive strategy game, belonging to the RTS (Real Time Strategy) genre. The world presented in this production combines medieval history with elements of fantasy. The title combines an old, classic approach to gameplay with new ideas and attractive audiovisual setting. Pathos Interactive, an independent studio, is responsible for creating this title. The publisher is 2tainment GmbH. The player takes on the role of a Berrian, a fallen lord, who loses his lands, title and people as a result of a devastating defeat in the Battle of Beckron. Being on the very bottom, he swears revenge and, having gathered the last allies, sets off to fight. However, it will not be easy to halt the troops of the sinister Lord Karthor - victory may require huge sacrifices. Bannermen is a classic strategy from the RTS sub-species. The game focuses on constructing buildings, recruiting units and managing troops in the fight for map control. In order to achieve success, we must wisely manage our troops, making the most of their tactical capabilities and unique skills. It is also necessary to think strategically - manage resources and create bases in the right places. An interesting aspect of the Pathos Interactive title is the characteristic features of individual maps. Locations are very diverse geographically (snow, desert, forest, etc. ), and in addition you can often find unique powers - local spells that can be used against your enemies, provided that you manage to build the right temples in the right places and then defend them against attacks. Another interesting mechanic is the ability to use the environment in combat - we can, for example, prepare a trap by dropping an avalanche of stones on enemies. While playing, we also control the hero - he wields powerful magic, and his skills develop as the game progresses. In Bannermen we can play alone or with others. For those who prefer single-player gameplay, production offers an extensive fictional campaign, as well as the ability to fight single battles with computer-controlled opponents. Players interested in online modes will find here a full ranking system, thanks to which they will be able to assess the level of their skills against the competition. There is also a possibility of free mode clashes (apart from ranking), as well as friendly games (we choose our rivals and a map ourselves). Bannermen has a nice three-dimensional graphic design. The game world looks very impressive, delighting with the details even when the camera is far away. Textures are sharp, environmental models and detailed forms, and the lighting and shading technology is doing its job well. The advanced physics of objects also makes a solid impression. Game score 7.9 / 10 calculated out of 46 players' votes. Expectations before the premiere: 8.7 / 10 calculated out of 9 players' votes.